Journeys Which One Is The Better Food City—Toronto Or Vancouver? Which One Is The Better Food City—Toronto Or Vancouver? These dynamic cities in Canada will charm you with their unique offerings. Although they couldn't be more different in size, climate, and geography, Toronto and Vancouver seem to inspire the most rivalry when it comes to Canadian cities. For a time, when it came to dining out and all things cosmopolitan, Toronto was the default answer. Not so anymore, as Vancouver—known for its chilled out, hippy, west coast vibes—has found its own way to express itself. It's not the next Toronto, because it doesn't need to be. If anything, an additional restaurant city makes Canada ever more appealing as a culinary destination. A great restaurant scene should have diversity—of cuisines, price points, and geography—and in Vancouver, there's no better place to start than at Granville Island. Don't let the touristy vibe put you off—a lot of the city’s top purveyors can be found here, both in the sprawling Public Market and the surrounding warehouses. In the Market, Siegel’s Bagels serves some of the chewiest Montreal-style bagels (i.e. cooked in a wood-fired oven) imaginable, and Oyama Sausage Co.’s charcuterie, terrines and, of course, sausages, are the stuff of local legend. Apart from a huge permanent range, they have a menu of exclusive seasonal items that changes each month. No gourmand’s picnic basket would be without their goodies, from bresaola to wild boar head cheese. Outside of the market, still on Granville Island, is Artisan Sake Maker, one of the first sake breweries to ever open outside of Japan. Their lineup, presented under the label Osake, includes a sake made with Canadian rice, making it truly 100% Canadian, from grain to sake cup. Should you wish to continue your liquid diet, you’ll find that many of Vancouver’s finest bartenders are part of restaurants. It may seem a little counter-intuitive, but for two of the city’s best a standalone bar experiences, you’ll actually need to head to a hotel. The Rosewood Hotel Georgia, an immaculately restored heritage hotel in downtown Vancouver, is home to Prohibition, a speakeasy-style bar that is consistently named as one of the city’s finest cocktail destinations. Upstairs, the atmospheric terrace of Reflections has become a natural summer destination of the discerning, but what Reflections has become known for is its unique winter-wonderland-esque set-up in the colder months. It’s cosy, warm and an absolute charmer complete with fairy lights and a seasonal menu of hot cocktails. Even for oenophiles, British Columbia (the province in which Vancouver is located) is still a blind spot, no thanks to the onerous laws regarding the distribution of alcohol in Canada. Vancouver’s bars and restaurants are therefore ideal places for dipping your toe into the world of B.C. wines. You’ll find some intriguing, mostly natural producers on the wine list at Andrea Carlson’s Burdock & Co., which is on the mini restaurant row of Main Street in the Mount Pleasant neighbourhood. On the same vein as the wines, the rustic yet contemporary dishes here showcase locally-sourced, organic ingredients. Similarly, Toronto is where the wines of Ontario are most easily found, and just appearing on the scene now are wine bars like Chez Nous (798 Queen St East, Toronto, +1 416 781 4743, cheznouswinebar.ca), leading the way with an exclusively Ontario selection. Coffee fiends probably have better luck in Vancouver too—you might be surprised to learn that 49th Parallel, which can now be found anywhere from Los Angeles to Hong Kong, calls Vancouver home. For almost two decades, founder Vince Piccolo has been showing Vancouverites that there’s coffee beyond Tim Horton’s (he founded then sold Caffè Artigiano, one of the city’s first serious coffee shops). These days, you’ll also find up and coming boutique roasters like Moving Coffee, founded by Hongkonger Edmond Keung, who exclusively roasts specialty grade beans (rated over 80 points out of 100). Canada is a country of immigrants, which makes for an incredibly diverse food scene. Although Chinatown had long been established since the days of the gold rush and rail boom, it wasn’t till the 1980s that Hongkongers arrived en masse, giving rise to the nickname “Hongcouver”. The name perhaps most accurately describes the suburb of Richmond, around half an hour south of downtown Vancouver, where the streets and malls are lined with Hong Kong-style Cantonese restaurants, bakeries and cha chaan teng. The equivalent for Torontonians would be the suburb of Markham. Different ethnic hubs have developed in the regions around both cities, so you’ll find cuisines as diverse as Korean, Jamaican, Tibetan and Indian. When it comes to fine dining, some would say the country’s best food is in Montreal—the mystique and romanticism of Quebec’s French heritage still captures the country’s collective imagination, but Toronto has come to its own in the past decade or so, with many of the country’s top chefs now calling it home. 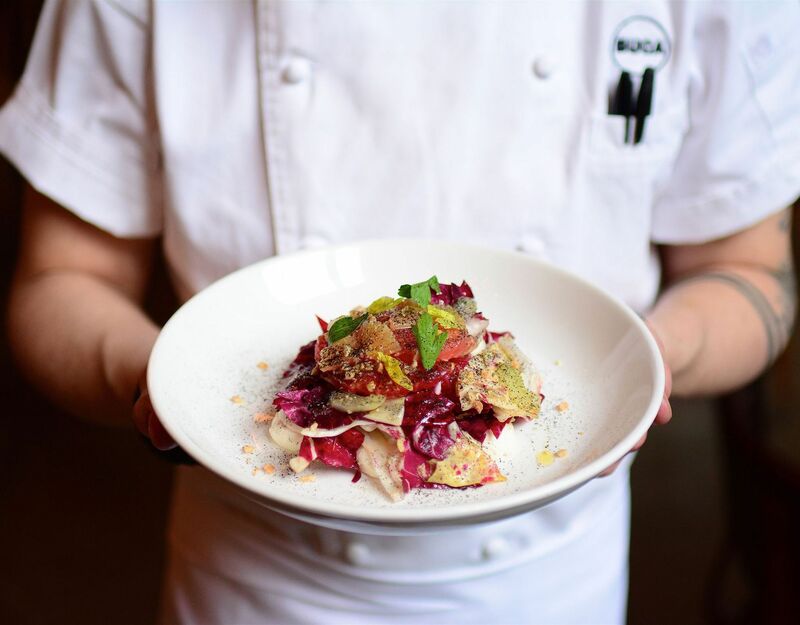 Patrick Kriss, whose meticulous plates at Alo made it the top restaurant in Canada, according to last year’s Canada’s 100 Best rankings, and Rob Gentile of King Street Food Company, the growing empire that includes the Buca brand of high-end Italian restaurants, are just two examples. Vancouverites aren’t big on super-plush, big-ticket places, but that doesn’t mean you won’t have special places to take your date. L’Abattoir, in the gentrified historical pocket called Gastown, is often regarded as one of the best fine diners in the city, and chef Lee Cooper serves up French-inflected Pacific Northwest cuisine; the wine list also offers a good introduction to B.C. wines. More recently, the same group opened Osteria Savio Volpe, a convivial spot that brings local ingredients to the fore through simple, rustic Italian cooking techniques, from fresh hand-made pasta to wood-fire grilling. Choosing to open in the unchartered waters of Kingsway, a few blocks east of the commercial row of Main Street, Mount Pleasant, it’s just one example of how Vancouver’s restaurant scene has plenty of space to grow, both physically and conceptually. This article first appeared on hk.asiatatler.com/dining.